Encounter Whales, Sea Lions, Dolphins, and Sea Turtles on this Natural Habitat Expedition!!! Charters include 3 hours on the water, plus wetsuits and snorkeling equipment if desired for up to five adults. A $100 deposit is requested to reserve your charter, and will be confirmed via email. 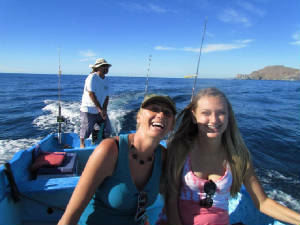 This incredible journey takes you into the Old Port of Todos Santos where sea lions bask and frolic, and ruins of the Old Port take you back to a time when sugar cane and other produce were exported from the fertile valley of Todos Santos. 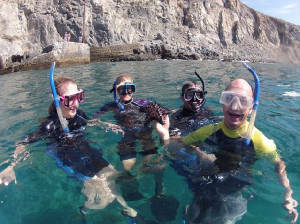 Snorkel among tropical fish, octopus, lobster, and hundreds of sea stars. 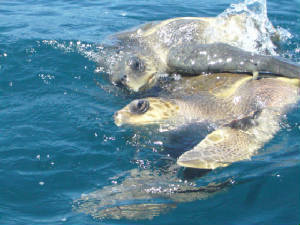 During summer months, mating sea turtles can often be seen on the water'ssurface. Sea turtles float on the surface for up to five hours when mating!! 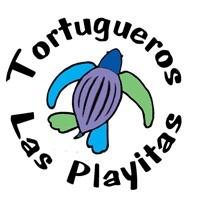 There are also dolphins, mantas, flying fish, commorantes, and more. Tours depart at 7:30 am daily and you can plan to be on the water for three to four hours. Lifejackets, wetsuits, snorkeling equipment, purified drinking water and lunch included. Sightseeing Excursions are not planned fishing trips, but there is almost always at least one rod on board, and a good chance your captain will reel in a couple fish!